We all have our passions that are on full display when guests walk into our home. Some of us love fancy artifacts from exotic countries. Others love beautiful furniture or draperies. Then there are the sports fans. Whether it’s memorabilia displayed throughout the home or a basement dedicated to a favorite team, there are a variety of ways to show off your love of sports. We’ve got some tips on how to spruce up different rooms to give them that athletic feel. Keep in mind that sometimes, simpler is better when creating your sports household paradise. Let’s start with a child’s room. Your kid may not have the same team loyalties as you do, but you can still sport up their room using décor for their favorite sport. 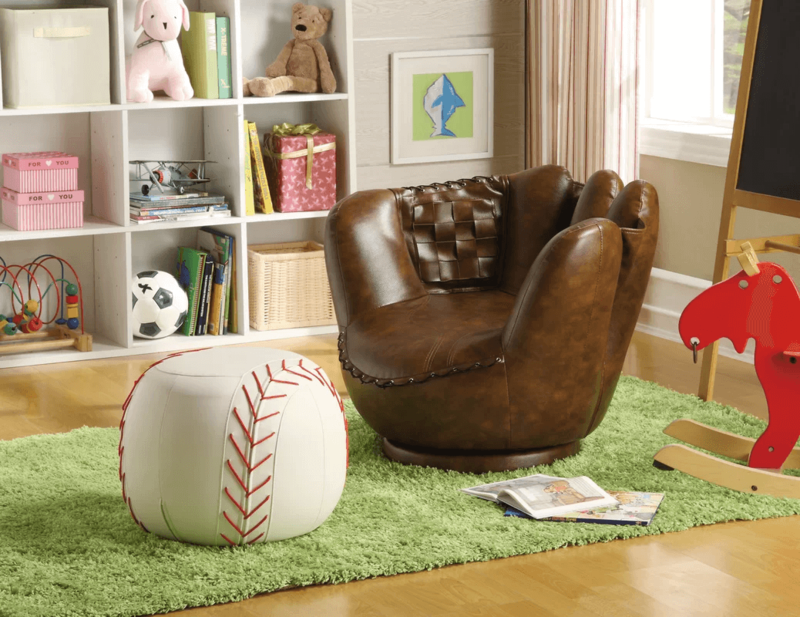 A baseball ottoman and a mitt chair are fun additions to your little sports fan’s playroom. They offer a fun and comfortable place for your child to read or snuggle up with you at the end of a long day. It brings sports into your child’s life in an easy and not so over-the-top way, with plenty of extra space to dedicate to their other interests. By ages 10-13, children really start to discover their sports love. A preteen baseball fan will appreciate décor that’s a little more grown up than a baseball ottoman, as in the example above. 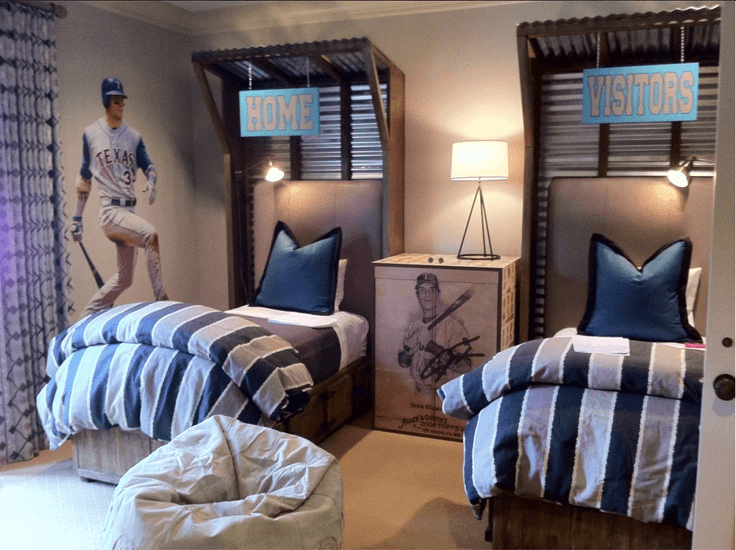 This room showcases the blue and grey of the famed New York Yankees in the bedding, along with some vintage photos of baseball players and themed decor (see “Home” and “Visitors” sign, perfect for sleepovers). For the young football fan, you could use lockers for creative storage spaces. Or if your kid’s favorite sport is basketball, you could create a room that makes them feel like they’re in Madison Square Garden every time they wake up. For a bachelor pad or a family home, the colors of your favorite team can be woven in creatively, with subtle hints at sports fandom. There’s nothing like the “good old days,” especially when it comes to sports memorabilia. Using vintage sports photos or gear adds the perfect “sporting” touch to any room. 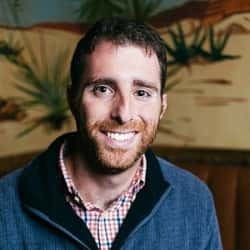 If you have a nice collection of sports memorabilia, you could display old programs or other items in a glass-cased coffee table or hang them next to some vintage pennants. And show off those unexpected pieces, too, like old stadium seats from a favorite former ballpark.